They told me, flat out, that they did not want me to be involved in future delegation meetings — and that Gonzales had proved to be far more adept as a diplomat than I had. I stood there and looked from door to door. None of the men acknowledged me or acted as if they even noticed that I had just appeared out of nowhere in the room with them. I stood there silently, not knowing whether to call out to them and ask any questions. I once again found myself in a situation with no preparation or intelligence on what to expect or how to engage those that I encountered. Soon afterwards, I heard the sounds of people coming down what sounded like a corridor in the direction of one of the doors. I then saw five figures emerge from the doorway and head in my direction. They all removed their hoods at the same time as they approached me. I immediately saw Gonzales walking behind a rather tall and beautiful woman with white hair. She had narrow facial features and large blue eyes. She appeared to be around thirty years of age. Gonzales had a smirk on his face. I immediately knew it was because the roles were reversed and he had me at a disadvantage. It is very common for soldiers thrown into extreme circumstances to have a buddy-buddy relationship that can involve sarcastic ribbing of each other to help dissipate the tension. In the past, I had been the focal-point and he was feeling a bit confused and kept in the dark. Now the tables had turned. I was in the same uncomfortable position Gonzales had been in before. The group stopped about 20 feet away from me. Gonzales conversed with them and then approached me alone. The woman and two others turned and left the way they came. This left one male, with the same basic features as the woman, standing 20 feet away from me. When Gonzales got close enough I reached out to shake his hand. He put both his hands up and took a step back. He then turned and started walking towards the person standing close by, and motioned for me to follow. I asked him what was going on. He said they are very serious about their cleansing ceremonies prior to entering the “Womb of Isis”. I tried not to make a strange face and just followed him. We walked towards the doorway that he emerged from. As we entered, I could see there was a symbol etched over the archway with laser-like precision. 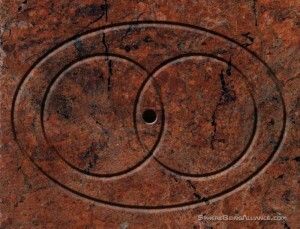 This symbol appeared over all of the doorways in the area we spent our time in. 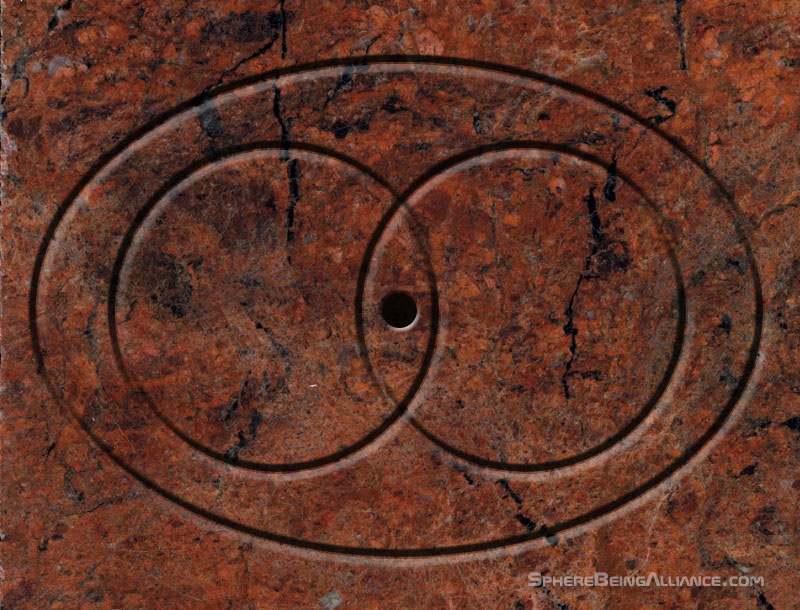 It was two intersecting circles inside an oval. The door led to a long, smooth corridor that was also carved out of the same granite-like rock. I could hear the echoing sound of water running over rocks while in the tunnel-like corridor. When we had reached what appeared to be the halfway point, there was a door to the left that led into a brightly-lit room where the sound of water was coming from. This door had an eight-pointed star on each side. There was a gold star on the left side and a red one on the right. 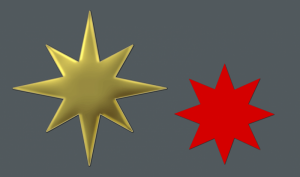 The gold star was slightly larger and positioned a bit higher than the red star. The man that was walking behind us stopped at the door and turned his back to it. We entered in and I saw a beautiful waterfall that was flowing through a port-like opening in the ceiling. There were off-white stalactites hanging from the opening, and what looked like milk-white water pouring down onto a statue of a goddess. The water then ran off the statue and drained into a pool that the statue was standing in. The goddess statue had a visible buildup of mineral deposits. The surrounding pool had an opening that created another small waterfall, which drained into a wider pool that was closer to the floor. After I had taken in the view of the water feature, I looked over at Gonzales. He told me to remove all of my clothing and place it next to his — on a stone pedestal that rose about 3 feet out of the polished stone floor. I noticed other pedestals with folded-up garments of different colors sitting on top of them. There were also what looked like thin gold crowns or tiaras laying on top of these garments. I looked at him and told him I had no idea what was going on. I would really appreciate an explanation, right away, as to why I was being asked to disrobe. I also wanted to know what other strange requests I might receive. Gonzales seemed to be enjoying himself a little too much at my expense, and that didn’t improve my mood. He then smiled and told me to relax. 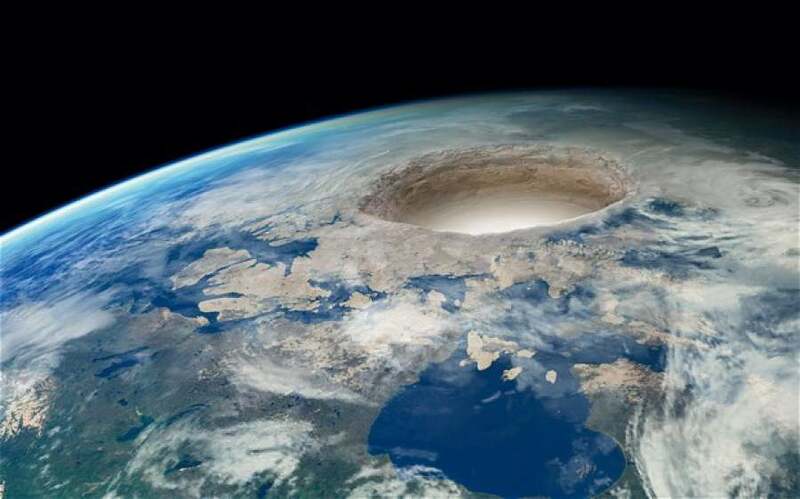 He stated that these subterranean groups are very much into Venus and goddess worship, and that they reference their sanctuaries as being the “womb of the Earth”. It is holy ground — and we have to respect their cultural and spiritual practices. I was already shivering a little bit from wearing the black exercise shorts and blue tee shirt in the already cool environment. Gonzales saw the hesitation on my face. He told me not to be so shy. He said he would turn around, but that he had to instruct me in the cleansing process. He told me that if I was uncomfortable with him seeing me naked, he would leave the room and send in the other person who watched and guided him through the process. I shook my head and took off my clothes, folded and placed them on the pedestal. I was standing there totally humiliated. Gonzales was chuckling and trying not to look directly at me. Right when I thought it couldn’t get any worse, the woman walked in with a folded robe, sandals and towels in her hands. I exhaled in displeasure and glared at Gonzales, who was still enjoying my predicament way too much. He took a step back so the woman could approach me. She smiled and handed me the garment and towels. She bowed her head, turned and bowed her head to Gonzales, and then left the room. After she had left the room, Gonzales broke out laughing. He walked over, took the items from me and set them down. He made a joke about how cold it was in the room. He then began guiding me through the bathing and cleansing process. The water was ice cold. After I had dried and placed the robe and sandals on the pedestal, he told me that I needed to remain quiet and respectful during this first visit and just observe. He said that these groups have recently formed this council out of necessity. Some of them have a very long and complicated history with each other. He also told me that these groups had an even more complicated history with surface civilizations – going back over many thousands of years. I was informed that they do not have the most positive view of us. He further stated that these groups often come across as elitist and prejudiced against the surface population, and that I needed to keep my opinions on the matter to myself. I was trying not to let my ego be a factor in the equation. Nonetheless, I was feeling a little frazzled after the public bath, being laughed at and then having Gonzales worry I was going to speak out of turn as I did at a previous meeting when there was a veiled threat against my family. This was in the Committee of 200 meeting that took place at the castle, detailed in earlier posts on this site. I know Gonzales meant no harm and this was a part of his personality, but it was still a little soon. Some wounds were still fresh from the previous couple of meetings I had with the SSP Alliance Council, when things had gotten pretty heated. I took a deep breath and cleared my mind of the prior emotional baggage, so that it would not be detected by our current hosts, who had greater intuitive abilities than any average human like us. I told Gonzales I understood, and was ready if he didn’t have anything else to add. He then picked up on how frazzled I had been, and looked a bit concerned. He looked at me, tilted his head and started to say something. Right then, the woman and three men walked a few paces into the room. They bowed their heads and looked at us. Gonzales then turned and walked towards them, motioning once again for me to follow him. A few feet before we reached the others, they turned and walked out the door ahead of us. They turned left, and then continued on down the corridor. The corridor then began to angle down and curve to the right, where it then widened into a rectangular room with tall ceiling. A larger door was directly ahead. I then wondered to myself where all of the light was coming from. The corridor and rooms were well lit, but I had not seen any source for the lighting. We stopped in the room and no one was speaking. I was looking around for the light source when the woman turned and spoke to me. Her voice had an accent I have never heard before. I was surprised and looked at her, but before I could say anything in response, another woman walked through the large door. She was wearing the same white silk robe, and was wearing the hood over the top of her head. She looked at each of us, making eye contact with us one by one. Then she turned and went back out through the doorway without saying a word. Somehow I knew immediately to put my hood on, as did everyone else. We walked through the door and then down a curved stone staircase, one level down. The stairs angled to the left. At the bottom, there was another doorway with the same symbol over the arch. We began to file through the door and into the room, two by two. There were people in the same robes sitting around an oval table. Other people were standing and sitting on stone benches, and they also wore the same robes. I then began to notice that every person was wearing a pendant. The pendants were often different in appearance, and had various symbols on them. I realized that these were the symbols of their groups. I noticed a few of them touching and tapping their pendants. They would then look down at what could only be described as holograms. These pendants were not just a jewelry that represented their civilization or group. They were also a technology. As Gonzales and I were being shown our seat at the front of the room, I got a good look at the stone table. 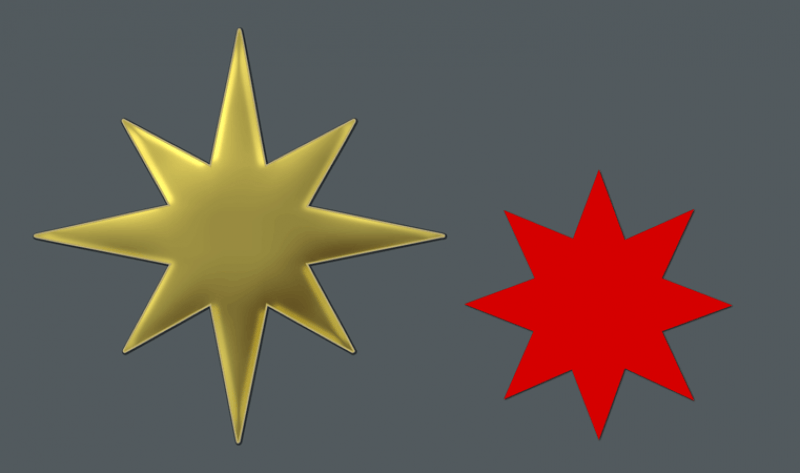 It had a large, golden eight-pointed star in the center, with a smaller eight-pointed red gem star to the bottom right of the gold star — from our perspective. The people who had guided us to this point seemed to be the hosts of the meeting. They were all wearing pendants that appeared to feature a stylized image of Saturn, including the rings. Each of these pendants had a single jewel that was placed at a different location on the surface of the planet. Gonzales later told me that the location of and type of gem represented where their particular region was located under the Earth.